Saudi Crown Prince Mohammed bin Salman gestures during a military parade by Saudi security forces in Mecca, Saudi Arabia, Aug. 23, 2017. Saudi Arabia says it has suspended dialogue with Qatar to resolve an ongoing conflict with its Gulf neighbors, following a fresh row over a phone conversation between Saudi Crown Prince Mohammed bin Salman and Qatar's Emir Tamim bin Hamad al-Thani. Saudi Arabia claims the Qatari News Agency misrepresented the substance of the call. Saudi Arabia and Qatar appear to be engaging in diplomacy-by-megaphone once again, as the media of both states wrangle over a phone call Saturday between leaders of the two countries, ostensibly to mediate a three-month-old conflict. Salman and al-Thani spoke after efforts by U.S. President Donald Trump and Kuwaiti Emir Sheikh Sabah Ahmed al Sabah to bring the two sides together. Qatari media reported that Salman and al-Thani each agreed to appoint an envoy to sit down and discuss outstanding differences, following mediation efforts by Trump. It said both sides agreed on the need to resolve their conflict at the negotiating table "to preserve the unity and stability of the Gulf Cooperation Council, while not compromising the sovereignty of individual states." But the Saudi Press Agency made no mention of the appointment of envoys to discuss the conflict, insisting that Salman would talk to allies Bahrain, the United Arab Emirates and Egypt before releasing details about the substance of his conversation with Qatar's emir. Qatar's Emir Sheikh Tamim bin Hamad Al-Thani attends a Gulf Cooperation Council summit in Doha, Qatar, Dec. 9, 2014. 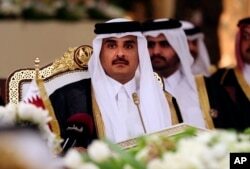 The conflict between Qatar and its Gulf neighbors Saudi Arabia, Bahrain, and the United Arab Emirates, bolstered by Egypt, erupted on June 5, after those states demanded that Qatar put an end to its alleged support for terrorist groups in the Middle East and North Africa. Qatar's neighbors also imposed an economic boycott on Doha, closing their borders, ports and airspace to the nation until it fulfilled 13 key demands. A previous row between Qatar and the GCC in 2014 was resolved after Qatar pledged to refrain from activities deemed hostile by its neighbors. Hilal Khashan, who teaches political science at the American University of Beirut, tells VOA the fresh media row between Qatar and Saudi Arabia is merely a smokescreen for ongoing mediation efforts, and that Saudi Arabia does not want to anger its allies by giving the impression that it is giving in to Qatar. "What matters is not what the Saudi media is saying. What matters most is that this [phone] conversation took place. The Saudis say they will not budge. They need to do that to give the impression that they did not back off [on their initial demands]." Khashan points out that negotiations in the Arab world involve saving face as much as substantive action. "If the Saudis decide to put an end to the conflict, they need to give everybody the impression that they prevailed. For Arabs, the question of saving face is important. They can't say 'we talked to the prince of Qatar and will put an end to the conflict.' So, as they make a move forward, they try to justify it, and move a step backward [again]." Khashan argues that the conflict with Qatar - if it continues - will in the long term benefit Iran, and he stresses that end would be totally unacceptable to Saudi Arabia. Doha recently resumed diplomatic ties with Tehran, following a break in relations that had been coordinated with other Gulf Cooperation Council states. The GCC has yet to resume ties with Tehran.